Dear Fr, I have had a happy experience of the Ord. rite (let's not mention the 3yr lectionary and bits of the calendar), but I do find that the thanksgiving after comm. feels a bit too drawn out. Maybe there could be an option for it to be said secreto & we laity could follow silently. And the use of the English Missal of the elder, pre-1958 Editions with the old Easter rite should be allowed to be used as the EF of the Ordinariate. E. C. Ratcliff, The Liturgical Work of Archbishop Cranmer¬ Journal of Ecclesiastical History, October 1956; reprinted in Thomas Cranmer, Three Commemorative Lectures, Church Infor¬ mation Office, 1956. Dom Gregory Dix, The Shape of Liturgy, p. 672. Every change since has been an attempt to alter Cranmer’s “effective attempt”. The Antiochian Western Rite in the States is reviewing the first book above as well as Blunt, Dowden, and pertinent Ratcliff articles in preparation for a new Altar Missal, replacing our current 1958 Knott Missal, which hopefully will finally eliminate all remaining aspects of Cranmer’s “effective attempt”. Of course as we are not Novus Ordo in our liturgics we don’t have that to contend with. "Gloriously, it throws the windows open to a liturgical experience which is in a sense 'vernacular' but utilises a sacred vernacular closely similar to the Latin of the Roman Rite." Precisely this. Every single Catholic missal and prayer book I have seen from the 1800s on up to 1960 has the same kind of sacral English. I was only born in '71 but I have to think that Catholics were simply used to praying that way before ICEL did its dirty work and, by the sort of centralizing ultramontanism Father is always on about (and rightly so), wiped out that hallowed tradition with the stroke of a pen. A personal observation, if I may, on the suitability of the liturgy for a wider audience. My Italian descent (unlike the great Christina Rossetti) has left me with no prior experience of Anglicanism. 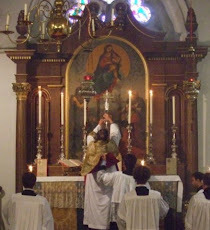 I now attend an FSSP parish and also, as a great admirer of what you all are doing, occasionally attend Ordinariate Masses. Although I was expecting to feel rather at home in the Ordinariate Use, and truth be told I have thought in the past that it would be the perfect ordinary liturgy for the English-speaking world, I was rather surprised to find it somewhat unfamiliar and even foreign. Granted, I haven't been to all that many and I recall having a similar reaction to the 1962 Missal. So perhaps my opinion is yet premature, and I would certainly be curious to see, Father, if I would have the same reaction to a Mass with your suggested pastoral revisions. One crucial point though either way….whatever you are all doing to preserve your patrimony has clearly been a smashing success, if it feels unfamiliar to a Catholic steeped in both forms of the Roman Use. On a historical note, I wonder if the two paths of English Catholicism don't represent two complementary streams--one that survived within Anglicanism and one that survived among the recusants and the Romanizing influence of the Jesuits at St. Omer's and in Baltimore. Perhaps it's right that we English-speaking Catholics preserve both of these together. Can the calendar be employed for mutual enrichment, as elsewhere in Christendom? Like the feasts of the Jameses--do the Roman Rite parishes of Toledo not use the Mozarabic liturgy on the feast of the Greater, and do not the Eastern Orthodox use the Divine Liturgy of St. James on the feast of the Lesser?